Last week I had vague plans to do a ‘meet and greet’ somewhere on the Eden Naturist Estate, but those plans fell through when I got a surprise invite to the annual SLN Xmas BBQ. I say ‘surprise’ because Howie has been largely absent from SLN for the past year, and this annual event wasn’t something I expected to happen. I suppose I could have organised such a thing myself, but it’ Howie’s thing, and not for me to steal his thunder. I thought it would wither on the vine without his presence…but no. The invite arrived for last night, December 18th, and Howie was ‘in residence’ to greet friends old and new. As is usual in these things, people drift in and out, working ‘party time’ around the remainder of their real, and otherwise Second, lives. 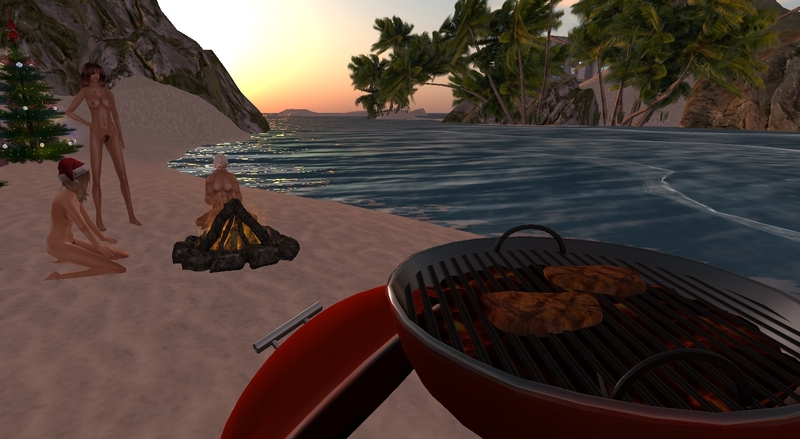 I wasn’t there all the time, I had to log in and out due to RL commitments, but I managed to catch up with some old friends, including Howie himself, as well as some familiar and some new faces. As you know, Eden is a celebration of boats and life afloat as it is as much about naturism, and we even hailed down a passing yachtsman to swim ashore, grab a hamburger and meet some new faces before continuing his sailing. Howie stands underneath the sign at our HQ on the Eden Naturist Estate, now proudly reading merely ‘SLN’. I’m proud to have a diverse range of friends in SL, and Fatima is one of them. She lives her life in SL as a Muslim, as she does in RL, and dresses accordingly. When I came online for the second time last night Fatima was online, so i took the opportunity to invite her to teleport over, taking care to move away from the main party area and dress myself before doing so, out of respect for her views. Muslims are much maligned around the globe, and it has reached the point where their presence in SL is practically non-existent. ‘Salaam! May I wish all of my Christian friends a very Merry Christmas as you celebrate the birth of your prophet. May all of us, Christian, Muslim, Jew, non-believer have a peaceful new year in real life. 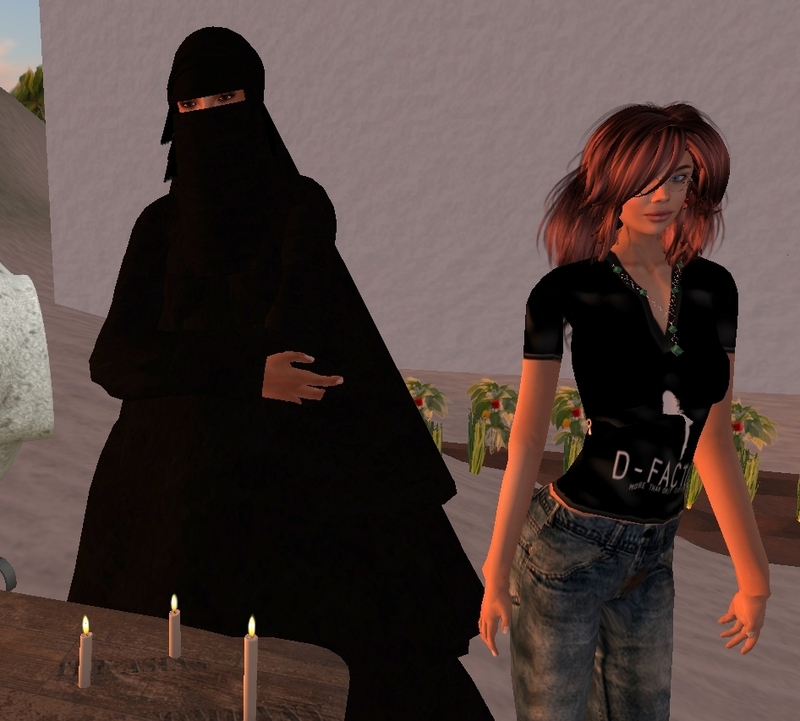 Let Second Life be a catalyst for mutual understanding between our great religions’ is Fatima’s message this Christmas. Here’s hoping that Muslims make their presence known to a greater degree in SL in 2017, and that those of us who aren’t Muslim take the time and make the effort at some mutual understanding of each other. SL will only be a grain of sand on a beach in helping foster mutual understanding, but it’s from acorns that great oaks grow. Hot chocolate, cake, turkey, brandy and cigars. Help yourself at the SLN Xmas BBQ buffet. More pix to follow as Harry edits them, apparently, but I think the post’s long enough now for us to call it a day on this post.